Kimberly Clark Professional has introduced four new graphic designs for its Jackson brand Halo X welding helmets. The introduction is in keeping with Jackson’s history of innovation and another step forward for the first safety manufacturer to introduce the concept of graphic design on welding helmets more than a decade ago, the company says. 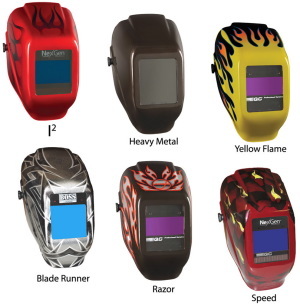 With Jackson, welders can select the helmet design, auto darkening filter and graphics to meet their specific needs and preferences. Product design and individualized choices can help improve compliance, thereby helping to ensure worker safety, maximizing performance as well as enabling welders to exhibit their own personal style on the job, Kimberly Clark says. The Halo X shell weighs only 6-ounces. The lightweight, flexible design was created in response to user demand for a helmet that was lighter and more comfortable than traditional welding helmets. It is ideal for extended wear in high-heat environments and is available with two types of auto darkening filters: BOSS and NexGen.